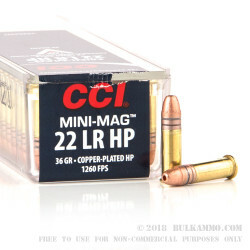 CCI designed the Mini-Mag as a high-velocity .22 round as one of the first high-velocity .22 LR cartridges. They followed the original 40 grain CPRN plinking ammo with this 36 grain Copper-Plated Hollow Point as a great option for a varmint load in high velocity. Muzzle velocity on this load is estimated to be 1260 fps. .22 LR ammo with Copper-Plated Hollow Points are a good choice for hunting small game as the copper plated jacket improves feeding reliability, while the hollow point construction increases expansion and is recommended for a quick, clean kill. 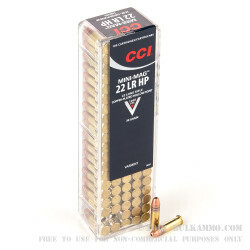 CCI is produces their rimfire ammunition in Lewiston, Idaho as well as Blazer, Blazer Brass, and Speer centerfire ammunition. 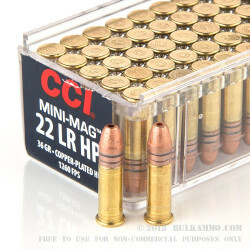 the best 22 ammo for multi pur. Q: Are the hollow point 22 rounds generally as accurate as the ball type? A: That depends. Compared to match grade solids, no. 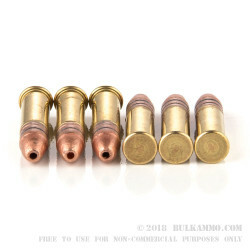 Compared to bulk solid bullets, yes, the two (hollow point and solid) are about as accurate. A: We don't recommend the use of anything but round nose ammunition in the Tec 22. Q: What is the best way to store large amounts of ammo for long term storage? A: Store the ammo in a cool, dry place, preferably in a container that also protects the ammo from physical damage. Q: What is the best way to store this product (long term). Thanks! A: Ammo lasts longer when stored in a cool, dry place that is far from heat sources or moisture/water sources. Think about areas that might catch fire or flood easily - don't store ammo there. Q: What is the benefit of the copper plating on this ammo? Does it improve accuracy, keep the barrel cleaner, improve ammo life, or some other purpose? A: Copper plating on .22LR projectiles mainly serves as a low cost way to reduce lead fouling. It is also generally found on higher velocity .22LR loads, as lead fouling sometimes increases with velocity. Q: Is this ammo good for small game hunting in bolt action rifle and semi-automatic rifles as well? Would you recommend the ball ammo for small game over the hollow point? A: We would recommend high velocity, hollow point ammo for hunting small game. Q: What are the pros and cons of using .22 mag over .22 LR shells, assuming the rifle is rated for .22 mag shells? A: .22 WMR/.22 Magnum and .22 LR/.22 Long Rifle are not interchangeable. If you have a rifle chambered in .22 Magnum, you should fire only .22 Magnum cartridges through it.